NIC Binding is the order at which windows loads the NIC’s at boot up and takes the first one as a primary NIC. Right-click the My Network Places icon and choose Properties. Or Control Panel icon then choose Network Connections. 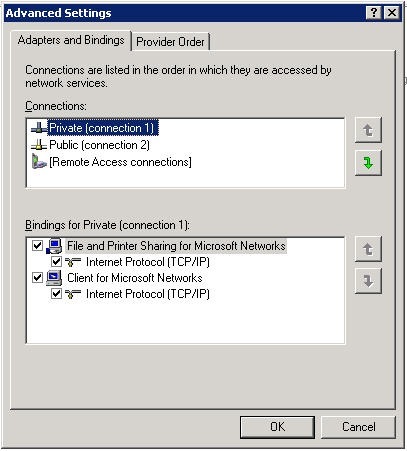 From the menu of the Network and Dial-up Connections window, choose Advanced > Advanced Settings. On the Adapter and Binding tabs, in the Connections area, ensure that the primary NIC is listed first. From a DOS prompt, issue the ipconfig /all command to verify that your selected primary NIC appears first in the list. Right-click the Network Neighborhood icon and choose Properties. On the Adapter and Binding tabs, in the Connections area, ensure that the primary NIC is listed first.You can click the Move Up or Move Down buttons to arrange the adapters and select your primary NIC. In the Show Bindings for drop-down list, choose All Adapters. Ensure that the primary NIC is listed first.You can click the Move Up or Move Down buttons to arrange the adapters and select your primary NIC. NOTE: That if you are going to add more then one gateway to a windows OS you will need to have the Bind order set correctly because windows will take the first gateway from the first NIC that windows has as 1 in the bind order. This is even more important if one of the gateways does not route traffic to a public network. Tab ALT so menu bar appears then: Advanced -> Advanced Settings. The above listed method is used for adapters and bindings. I would like to know, how this can be achieved via power shell / VM power CLI commands. Thanks for sharing this. It just saved me a lot of time! Could they make that any harder to find in the next version of Windows?! Wow, fantastic blog format! How long have you ever been blogging for? you make blogging look easy. The total glance of your web site is excellent, let alone the content material! I have been blogging for 5years, I just try to add the detail that I needed when trying to find the information for the first time. Glad it has helped you out. is there a way to change this binding throu powershell?